Restorative yoga was developed by Yogi B.K.S Iyengar after he travelled from India to the U.K and noticed that westerners were a lot more stiff and inflexible in their joints. His introduction of using props such as blocks, bolsters, straps and the wall are used to maximise the opening and awareness of the body, providing support to the less flexible, and extra extension to more advanced student. I have heard Mr Iyengar still practices for 3 hours everyday which completely puts me to shame! Iyengar yoga emphasises precision and alignment in the postures. I remember my initial 4 sessions were fantastic with us doing the postures before and then after the correction process and the differences in which muscles I should have and shouldn’t have been using were mind-boggling. Not all poses need a big range of motion initially in order to get the pose and alignment of the body correct. Constant misalignment, over-extension and poor asana’s or postures can cause long term damage, sprains and strains to the body over time. I wanted to share with you two fantastic poses I enjoy. 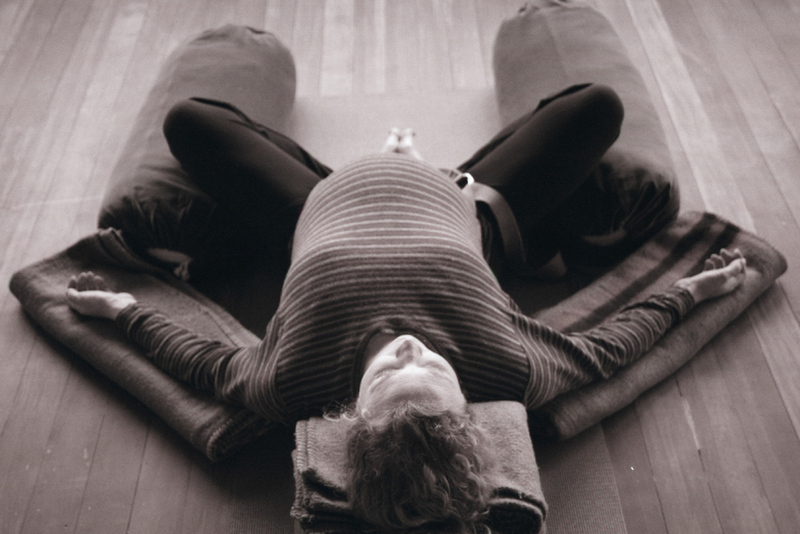 Reclining Bound Angle Pose – Supta Baddha Konasana – The stretch in this pose through the chest is phenomenal. Hold for 15 minutes. Legs Up The Wall Pose – Viparita Karani is very relaxing and calming. This 10 minute pose also allows time to listen to a guided meditation or to focus on your breathe. This seems to be a good-for-what-ails-you pose offering relief from many conditions over time. Thank you so much for posting this, I will definitely try the poses! Ahhhh yes, these are two of my favorite restorative poses, as well! My other fave is supported bridge- also a great pose for opening up our closed heart-space (hello slouching laptop users- me included). Thank you for sharing!